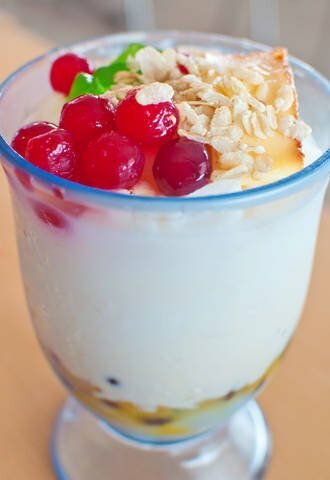 Probably the most popular refreshment during hot summer days, halo-halo is a sweet mixture of milk, shaved ice, boiled beans and a variety of fruits including bananas and jackfruit. Halo-halo is sometimes sold as street food but its popularity has made it an offering even in fast foods and expensive restaurants. No one really knows the origin of the name but this classic Filipino dessert is something to try. It’s your typical ice cream but prepared with coconut milk. It may be called dirty because it is usually sold in the streets but the number of people who patronize it can attest that it is not dirty at all! The most popular flavors of dirty ice cream are ube (a variety of taro), mango, durian and chocolate. Named so because of its ‘tamis’ or sweet flavor, this Filipino dessert is perfect for cleaning your palate after a hearty meal. It is made from cooking bananas boiled in sugar solution until it is tender and the sugar is caramelized. Minatamis is usually a part of the halo-halo mixture. Because the Philippines is blessed with fertile lands that produce some of the sweetest fruits in the world, a salad made of fresh fruits in season is a must-try. The choices are almost endless if you’re whipping up your own salad; mangoes, watermelons, avocadoes, papayas, lychees, pineapples are only some of the fruits that are available. And the must-try fruits? There’s the durian, pomelo and mangosteen. Have a favorite Filipino dessert? Let us know in the comments below. Filipino Street Food: Do You Dare?